Steven Gerrard stepped down as England captain on Monday and bookies are already taking bets on his replacement. Wayne Rooney is the overwhelming favourite and he has the experience, determination and drive that typifies Roy Hodgson’s England. But in my opinion Hodgson’s best decision would be keeping the armband well away from his leading goal-scorer…for his own good. A captain has to be more than a good player. He needs to command the respect of the squad around him and be the player that others want to play alongside…to play for. Philipp Lahm is a perfect example: he inspires his teammates despite his relatively quiet character. His understated approach and ability to handle pressure led Germany to their fourth World Cup a fortnight ago in Brazil. A good captain needs to manage relationships with the squad, media, manager and coaches and steer clear of controversy himself. Rooney just doesn’t fit that bill. The facts alone show that Rooney has one goal and one assist in three World Cups. According to Whoscored.com Rooney made just three successful dribbles in Brazil despite playing in advanced midfield. His failure to cover his full-back when operating wide contributed to Italy’s winning goal in Manaus. By contrast, Rooney netted seven times in the six World Cup qualifiers he took part in. For Manchester United he hit 19 goals under David Moyes in the club’s worst season in decades. Rooney’s natural confidence and explosive finishing deserts him when he needs it most – on international football’s biggest stage. Why does this matter when debating the captaincy? Well any man wearing the armband needs to show up for the big occasions where Rooney is yet to convince. Again, look at Lahm and his consistently impressive performances (across several positions) in Brazil. How do you motivate your team-mates when you struggle so desperately with the pressure on your own shoulders? Giving Rooney the armband would just give him another major worry. After all, he needed constant public support from the manager and coaching staff in the build-up to Brazil. Hodgson seemed keen to talk more about Rooney than he was ever actually asked. Rooney talked a good game in the build-up too but struggled massively on the left against Italy in Manaus. Many pundits and fans felt the drop was imminent but Hodgson sacrificed the in-form Raheem Sterling to accommodate him. Rooney got his first World Cup goal against Uruguay but he had little overall influence on the game. Compared to the half-fit Luis Suarez, who demonstrated exactly how to handle the expectations of a nation, Rooney struggled tremendously. Being England’s talisman is already an albatross around Rooney’s neck…how would he cope with the armband too? A team captain also needs a good relationship with the media. It’s important to keep those pesky journalists on-side… their words reach the ears and eyes of the country. Gerrard was exemplary in this regard. He was quick to reference Rooney’s excellent club form when Paul Scholes suggested the Manchester United man had “peaked early”. He would then warn against unrealistic expectations to shield his teammates from the same pressures he faced in previous tournaments. Media-friendly Gerrard was always good for a sound byte and he always said the right things. By contrast Rooney’s most memorable quote from the World Cup came in the form of an anti-media Facebook rant. His manner in press conferences felt short and terse. Rooney doesn’t enjoy that spotlight but it’s an annoyance he’ll have to court with grace as captain…ask Alistair Cook. And how would the fans receive him if Euro 2016 was more of the same? No-one was enamoured with his petulant reaction to being booed in that 0-0 draw in Algeria. The country was less impressed with his performances in Italy, and that Sterling was shifted for his benefit. Fans routinely criticise Rooney’s no-shows at big tournaments and that criticism would intensify if he were captain. Who then does Hodgson need to turn to? The captain should be a proven character, someone who steers clear of controversy while turning in first-rate performances. In my opinion England have that man in the shape of their 27-year-old goalkeeper. Vocal, confident and one of the few world-class players in the England squad, Joe Hart should be the next England captain. Wayne Rooney struggles enough at major tournaments and he doesn’t need added distractions. What he needs is goals and a clear enough head to find the opportunities that lead to them. 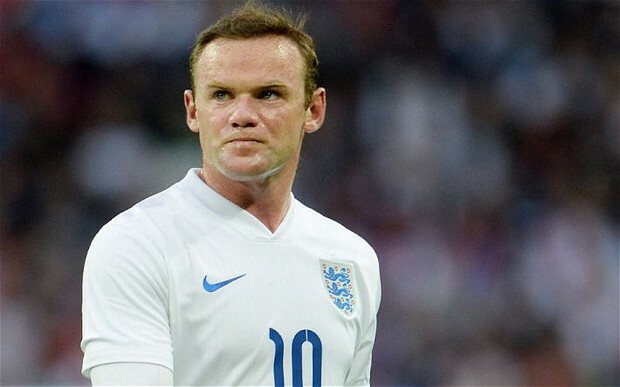 Outside of the World Cup Rooney has served England well but you can’t treat the captaincy as a prize. It must go the man who can handle that responsibility best and that is Joe Hart. In any case, how much longer does Rooney have at international level? At 29, he is probably entering the final half-decade of his career. Scholes suggested that Rooney could retire in three years and it’s hard to disagree with that prediction. Roy Hodgson is all about stability and if that is what he bases his decision on, then the armband simply has to go to Hart. Who should succeed Steven Gerrard as England captain? Yet another blatant ABU article . What experience has Hart got of being a captain? Suren, that is potentially the funniest/worst comment I have ever read on any website EVER! Stop being naive, Rooney rarely performs when it comes to the highest level, granted he shows up for united week in week out but turns to just another player when it comes to huge games. He had the most average world cup ever and yes the team didn’t perform as a whole but a player that is put on his pedestal should be performing whatever the occasion and whoever he’s playing with. He plays with Cleverly week in week out for gods sake.